It is important that students are in proper dress code for class. Please take time to read the requirements and let us know if you need help finding any of the required dress code. FSPA sells the required leotards and tights. We are also able to order other items at a low cost to you. Ask How! Hair completely off face and secured up off neck. Neat buns for all ballet students. No underwear worn under the tights. The tights are meant to take their place. Please wear a cover up over leotards when coming and going to and from the dance studio. Do not wear dance shoes outside. Street shoes are not permitted in the studios. Keep dance shoes in a small bag that you will bring into class with you. Please bring all belongings into the classroom with you. We are not responsible for your belongings when you are in class. Pink Cap Sleeve Leotard (No Skirt), Pink Footed Tights, & Pink Full Sole Leather Ballet Shoes, and tan mary janes that snap. Lavender Cap Sleeve Leotard (No Skirt), Pink Footed Tights, &Pink Full Sole Leather Ballet Shoes, and tan mary janes that snap. Ballet attire required for the corresponding age/ class level and tan mary janes that snap. Solid Leotard, Tights, Tan Jazz shoes, and tan mary janes that snap. Tap 1 & 2: Oxford style tan student jazz Tap Shoe. Dance or Athletic Clothes. (No street clothes). Tap 3 :Capezio Teletone Tan tap oxford, or another high quality leather upper tap shoe (NO split sole shoes), athletic clothing (No street clothes). Jazz 1-6: Tan soft split sole jazz shoes (slip on or tie up), solid colored leotard with black jazz pants or capris. No shorts. Modern 1-5 Solid colored leotard with footless tights or capri length yoga pants. No long jazz pants. Hair up on top of head. No shoes or socks. Acting/ Creative Drama: Loose moving clothing. No skirts or jeans please. Actors need to also have a notebook & pen. Required colored leotards are available for sale through the FSPA office. 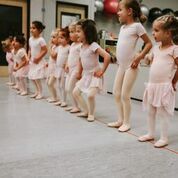 *Pink footed ballet tights, split sole ballet shoes, hair in classic bun, no shorts. Skirts may be worn only if they are solid and match the leotard color. ** In keeping with traditional Ballet dress code no undergarments should be worn under leotards. This includes both underwear and sports bras. Leotards should fit like a bathing suit and traditionally all leotards have a lining in them so a sports bra should not be necessary. Obviously some girls are a little more developed than others and if your daughter is uncomfortable without the extra support please reach out to Miss Jackie about options for your daughter. As always, we want everyone to feel comfortable in class!